Rounding off the SJA’s 60th anniversary year, it was time to celebrate the work of our colleagues at the British Sports Journalism Awards, with nearly 400 joining us for a glittering night at The Brewery in March. Report by Ian Cole, Pictures by Steve Rowe. 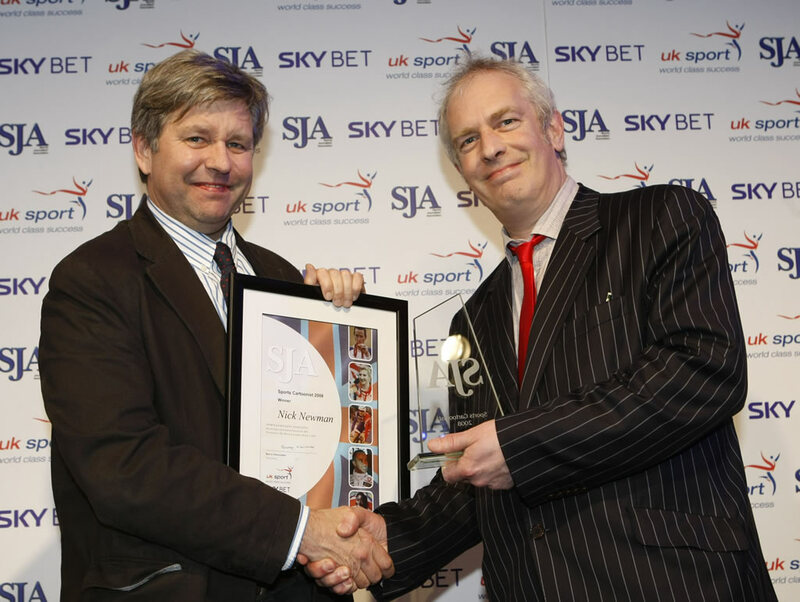 Patrick Collins, of the Mail on Sunday, and Edward Whitaker, of the Racing Post, were the star turns at the SJA’s 2008 British Sports Journalism Awards, winning Sports Writer and Sports Photographer of the Year respectively. Collins was chosen by the votes of national newspaper sports editors, who concluded that he was “the best of his generation. He never talks down to his readers, but uses a polite nudge and a smile”. It was the fifth time he had lifted the John Bromley Trophy, which he received from double Olympic gold medallist Dame Kelly Homes and former President Bromley’s widow Carole Ann. That sentiment echoed around the Porter Tun Room at London’s Brewery venue as our fiercely contested awards, sponsored by UK Sport and Sky Bet and decided by specialist panels of judges. 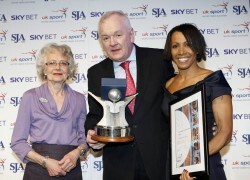 From small beginnings in 1976, the SJA awards have blossomed into the major competition in the sports media business with record entries, up 10 per cent in both writing and photographic competitions.This year, the awards were presented smoothly by ITV Sport’s Jim Rosenthal. It was a great night for Collins and his boys from Kensington. The MoS had seven awards or commendations. 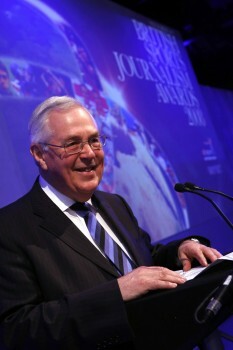 Rob Draper featured twice, as Sports News Reporter and sharing with his colleague Daniel King the award for Sports Story, the pre-Beijing row over athletes’ contracts including a ban on commenting on politically sensitive issues. The citation said the story “showed a combination of forensic attention to detail, an example of first class investigative journalism”. Draper’s portfolio included stories as diverse as “the Big Brother Beijing Olympics” to Andrey Arshavin’s transfer to Arsenal. While the MoS were happy with their haul, it was the Guardian who collected the prestigious Team of the Year title for their coverage of the Beijing Olympics. Judges said the sports pages “showed compelling journalism, authoritative writing backed by stunning pictures and graphics”. Sky Bet’s arrival as an SJA sponsor was recognised by the award of Sports Betting Writer and their Sportsbook Director, Ben Warn, was on hand to congratulate the first recipient, Steve Palmer of the Racing Post, who said his victory was bad news for Ladbrokes, who had opened a book on this category. Sky Bet also gave each of the 384 diners a free �10 bet. A special �500 charity bet fell to Marc Aspland, chief sports photographer at The Times, who advised by his paper’s Tony Cascarino, the former Republic of Ireland striker, took odds of 3-1 that all four of England’s Champions League entries would reach the last eight. Some 48 hours later three charities shared �2,000 when Max Tonetto blazed high over Manuel Almunia’s bar to give Arsenal victory in a penalty shoot-out against Roma. It was a double win for Aspland, who won the Sports News Picture of the Year award for a second year, capturing from behind Edwin Van der Sar’s goal the moment Manchester United won the Champions League final shoot-out against Chelsea in Moscow. Aspland dedicated his win to recently deceased photographer Peter Jay. Sports Columnist was Oliver Holt of the Daily Mirror, who saw off 26 rivals to step up to receive his award from Richard Caborn MP, an ambassador for England’s 2018 World Cup bid. Holt, the judges declared “ticks all the right boxes with a style of writing which encourages you to read to the very last word”. The two broadcasting awards – now the only such awards that recognise excellence in sports broadcasting – were decided by the votes of SJA members and produced familiar results. Sky’s Jeff Stelling won Broadcaster of the Year for the fourth successive year for his hosting of Soccer Saturday, while Garry Richardson’s SportsWeek, on BBC Radio Five Live, was Best Programme for the third year running. Olympic double Yngling gold medallist Sarah Webb presented both awards. Paul Kimmage of the Sunday Times was another who needed no guidance to the stage, winning Sports Interviewer for the fifth successive time. What’s so special about Kimmage? The judges said he shows “a unique combination of impeccable research and tireless questioning”. A new name on the honours board was former England cricket captain Michael Atherton, who moved into the Press Box on his retirement from the game in 2001 and was chosen as Specialist Correspondent for his cricket writing in The Times. The judges said his work was “factual, entertaining and with a point of view – but not missing the overall picture”. Atherton, who was also runner-up to Collins as Sports Writer, was away at England’s final Test in Trinidad but his sports editor, Tim Hallissey, collected the award from Sports Minister Gerry Sutcliffe. Sports Picture of the Year was an all-action sailing grab – you felt soaked just looking at it – from Clive Mason of Getty Images. Matt Dunham, of Associated Press, submitted a winning Sports Portfolio of pictures which “showed a good grasp of news values, the aesthetics of photography, coupled with a sense of humour”. 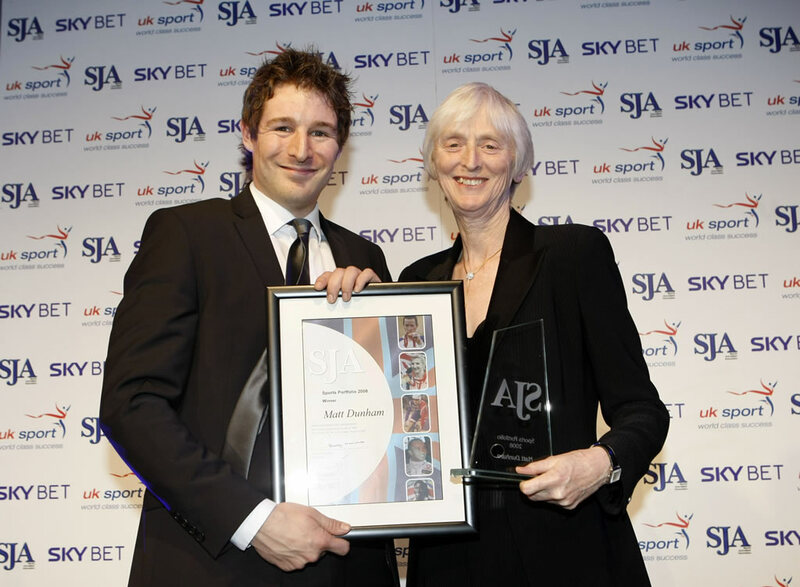 Feature Writer, presented by UK Sport chair Sue Campbell, was Owen Slot of The Times with an entry which included pieces on Rebecca Adlington, Joe Calzaghe and the Great Britain cycling team. Now prepare for a shock… The Charlie Sale-Alan Hubbard duopoly in the Diarist category has been smashed. David Hills of the Observer is the new king of the diarists. 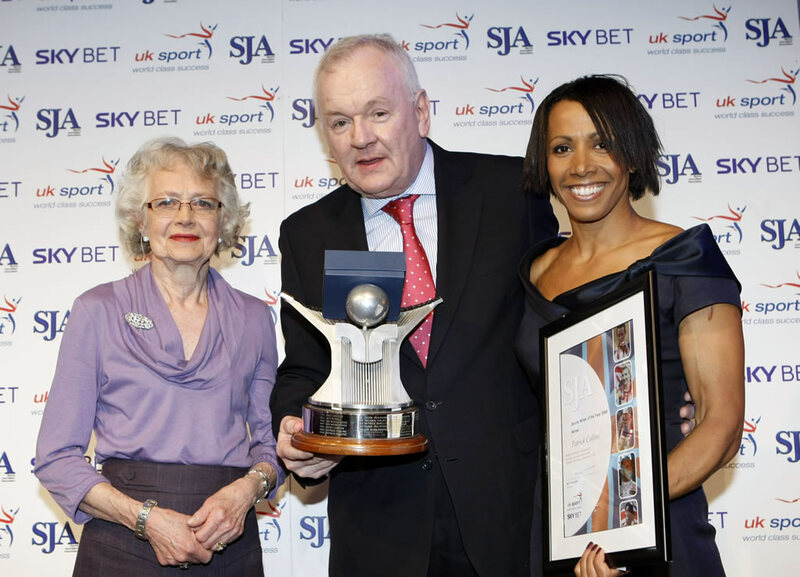 The SJA is proud to recognise youth and the regions in these awards and there was no more excited recipient than Emma John of Observer Sport Monthly, adjudged Young Sports Writer for the Ian Wooldridge Trophy, presented by Ian’s widow Sarah. Emma revealed that, as a cricket-obsessed teenager, her bedroom walls were covered with the great Wooldridge’s reports. The Young Photographer crown is now worn by Paul Gilham of Getty Images, who received the David Worthy Trophy from ace snapper Patrick Eagar. Cumbrian Newspapers dominated the Regional Writer category. Jon Coleman won, the judges praising his match reporting and interviewing, while his colleague Amanda Little was highly commended. Top cartoonist is Nick Newman of the Sunday Times for the third time in four starts. The judges said he “takes the skills of a news cartoonist and applies them to sport”. 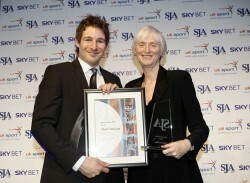 The Internet Sports Writer was won by golf correspondent John Hopkins for his work for timesonline, who said that it proved “you can teach an old dog new tricks”. DOUBLE-BOOKED: The SJA shared facilities at the Brewery with a rival function attended by Prime Minister Gordon Brown. Both events laid on a drinks reception and at least one SJA member was well into his first free drink at the PM’s bash before he realised something was amiss. COLE’S EFFORTS RECOGNISED: On a night full of surprises, no one was more shocked when their name was announced as an award winner than former chairman Ian Cole. 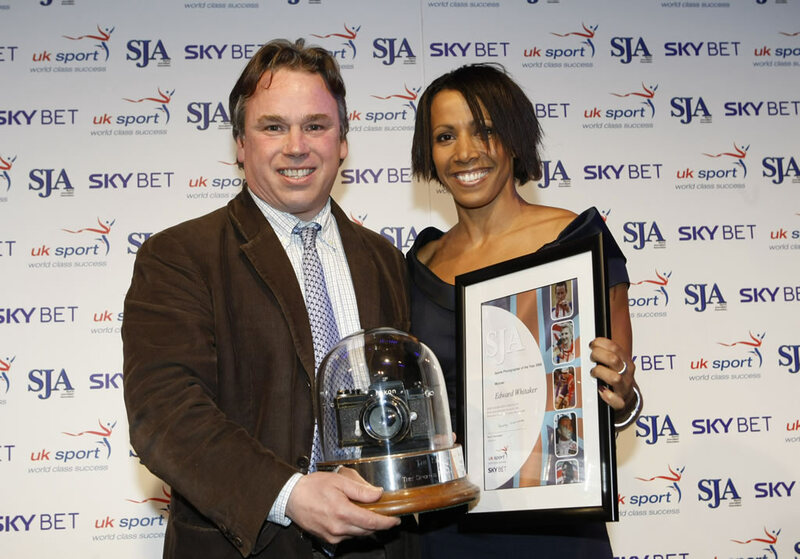 Cole was named as the recipient of the Doug Gardner Award, a prize that recognises outstanding service to sports journalism and the SJA, and which is determined by the Association’s officers. He is pictured receiving his award from SJA chairman Barry Newcombe. Cole is the epitome of the unsung hero of every sports desk in the land. Until his retirement as night sports news editor at the Daily Mail last year, Cole was the sort of “poor bloody infantry” who would make sure that the back pages came out, day after day, that the headlines fit and that even the starriest of star writers’ copy sang. And when occasion demanded, “Coley” would turn his hand to penning the required back-page news splash, too. Cole has fulfilled a similar yeoman role with the SJA, where he has served on the committee since 1986, including two spells as chairman, in 1991-93 and 1998-99. In part, Cole’s surprise on the night was magnified because as press officer, he had written the Association’s official press release, apparently with all the prize winners’ names, only a couple of days before. What he had not realised was that the SJA officers had omitted to give him the name of the Doug Gardner Award-winner. The award was shrouded in such secrecy that no mention of it was included in the evening’s script as furnished to presenter Jim Rosenthal over the weekend, and chairman Barry Newcombe had to write the commendation less than an hour before presentations began. CHARITY WINDFALL: Doug Gardner, after whom Cole’s award is named, was another stalwart servant of the Sports Writers’ Association, serving as its secretary for 12 years until he died in office. Attending the awards evening for the first time on Monday was Trevor Gardner, Doug’s nephew, who had asked the SJA to support the fund-raising for the Liam Ross Foundation. The foundation is a charitable cause in aid of children with heart disease, named after Trevor’s own 13-year-old nephew who collapsed and died after playing a game of football at the end of the year. A collection for the cause raised �2,200. Commended: Daily Telegraph (Olympics), Guardian (Munich Anniversary). Commended: Matthew Syed (The Times). Commended: David Conn (The Guardian). Commended: Charles Sale (Daily Mail). Commended: Chris McGrath (The Independent). Commended: Ian Stafford (Mail on Sunday). Commended: Julian Finney (Getty Images), Dan Matthams (Nottingham Evening Post). Commended: Mark Hodgkinson (Daily Telegraph). Commended: Derek McGovern (Daily Mirror). Commended: Amanda Little (Cumbrian Newspapers). Commended: Matt Dunham (Associated Press), Tom Main (Freelance). Commended: Steve O’Brien (Mail on Sunday). Commended: Stu Forster (Getty Images), Mark Thompson (Getty Images). Commended: Shaun Botterill (Getty Images), Mark Pain (Mail on Sunday).